Liberty Puerto Rico has begun to offer its services to residential and commercial customers in Maricao, giving the company presence in all the main island’s municipalities. To celebrate this milestone, Liberty will be celebrating a family day May 13, from 12 p.m. to 6 p.m. at Maricao’s public plaza, the company announced. “We are very happy to be here in Maricao and thus complete our presence in all the main island’s municipalities. Now, more Puerto Ricans can enjoy our services and see that Liberty is actually the best communication and entertainment alternative,” said Naji Khoury, president and CEO of Liberty Puerto Rico. With the themes of “Liberty comes to Maricao” and “the best coffee with the best Internet,” the activity offers attendees several amenities and family activities. One of them is the Liberty Cyber Café, an area furnished with stools, tables, and WiFi Internet service, where customers can use on-site computers or connect from their own electronic devices to experience Liberty’s broadband Internet. The Liberty Cyber Café will also have a video game area for gamers and a video room where attendees can sample all of Liberty’s television offerings. 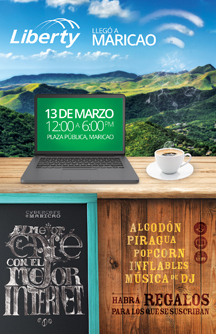 Guests will also have the opportunity to sample coffee from the Maricao region prepared by a professional barista. For families, the activity will feature a variety of kids’ bouncers and an inflatable basketball hoop, in addition to cotton candy, popcorn and snow cone stations. There will also be a DJ on hand to enliven the afternoon. Liberty personnel will also be at the activity to help attendees who wish to subscribe to any of Liberty’s products and services. Hey Buddy!, I found this information for you: "Liberty begins servicing Maricao; now present in all towns". Here is the website link: https://newsismybusiness.com/liberty-maricao-present/. Thank you.